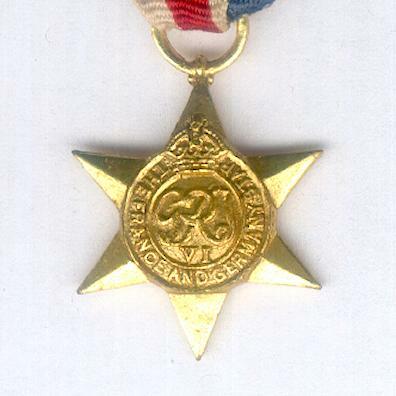 Miniature gilt six-pointed faceted star with lateral loop for ribbon suspension; the face with the crowned cipher of King and Emperor George VI centrally within a stippled ring inscribed ‘THE FRANCE AND GERMANY STAR’; the reverse plain with maker’s mark ‘LUDLOW LONDON’; diameter 18.05mm (0.71 inch); on original long ribbon, paper and glue residue to the reverse. 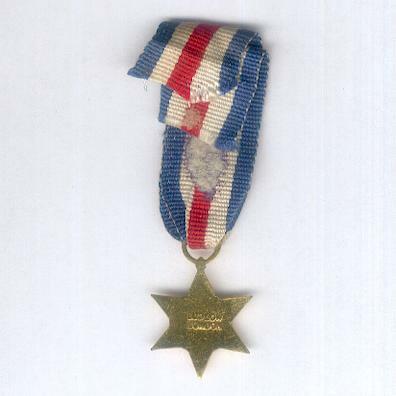 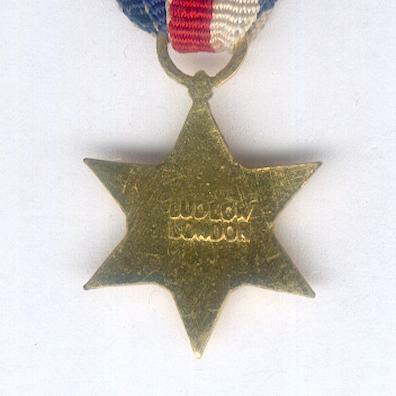 The Star was instituted in May 1945 to be awarded for operational service between D-Day (6 June 1944) and V.E. 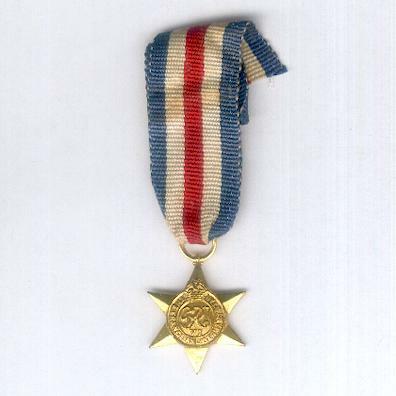 Day (8 May 1945) on land in France, Belgium, Luxembourg, the Netherlands or Germany; at sea in the North Sea south of a line from the Firth of Forth to Kristiansand, in the English Channel or in the Bay of Biscay east of longitude 6° West in direct support of land operations in those countries; in the air for operational flights over the land or sea area denoted.